Busting at the seams with music, the production hosts minimal dialogue. Even the plot is bare bones, taking a backseat to all the glitzy music of the 60's and 70's. Perhaps inspired by, perhaps based on the rise of the Supremes, Beyoncé slides into Diana Ross-like high heels with glamour and chops. 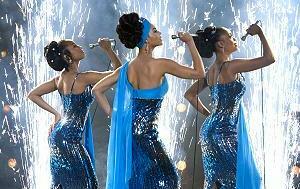 She's solid, but it's really the performances of Jennifer Hudson as Effie White (Florence Ballard?) that take down the house. In fact, despite a great amount of Oscar buzz around this film, and strong performances by all involved, no one completely break-out rocks save for Jennifer Hudson. What a voice. Gave me chills. The somewhat soapy story line and campy dialogue-to-song transitions tend to pull the production down into the B range. The top notch cinematography, direction, editing, and hardy performances all around, push it to the top of that range. But, again, it's Jennifer Hudson's contribution that squeak it over into the A- range. And while, the production goes a bit long, its lulls are minimal. Lastly, the songs were written for the production with the touch and feel of the Supremes (in my opinion), but are not actual Ross/Supremes songs. The same is true for Eddie Murphy's character, which appears to be inspired by (at least) James Brown. While the songs themselves aren't blockbusters, their homage and hints of these musical icons make them fun and enjoyable for purposes of the production. Free Ross Anthony Signed Book Contest! Starring Jennifer Hudson, Beyoncé Knowles, Anika Noni Rose, Jamie Foxx, Eddie Murphy, Keith Robinson, and Danny Glover. Screenplay by Bill Condon. Based on the book/lyrics for the Broadway play. Produced by Laurence Mark at Paramount/Dreamworks.